Flexible screw conveyors are materials handling equipment that involve the use of a rotating screw within a tubular or polygonal conveyance channel. When a motor turns the screw, the material within the channel is forced upwards as the screw turns. The defining feature of flexible screw conveyors is their flexibility compared to rigid screw conveyors. Many bulk material handling systems incorporate screw conveyors to move material upwards or from a hopper into the processing line. 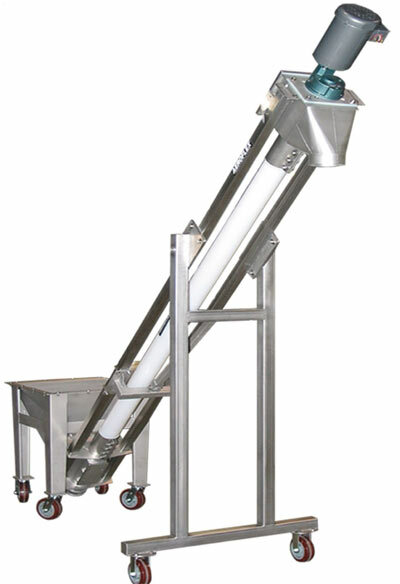 Screw conveyors offer a few advantages over other conveying systems in certain situations. For example, in the conveyance of powdered, granulated or other very fine materials, belt conveyors can be an inappropriate choice; the materials can become ground into the belting, and they can escape the belting and accumulate around other conveyor components, such as rollers. Because screw conveyors completely enclose the materials they convey, and because the only moving part in a screw conveyor is the turning screw, there are fewer opportunities for product loss or equipment damage. Also, screw conveyors can be used to transport materials vertically. Vertical and inclined screw conveyors are common tools in the agriculture, mining, manufacturing, and many other industries because they can assist in the loading of raw bulk materials into processing or storage equipment. These conveyors are usually equipped with an inflexible conveyance channel; in most cases, channel flexibility is not a necessary feature. In other cases though, such as in the case of portable screw conveyors, flexibility can make storage and use of screw conveyors easier. Portable screw conveyors are useful tools in a number of bulk material handling contexts. One prominent example is in agriculture; portable screw conveyors can be used to transport granular particles like harvested grain into storage equipment. Because the screw conveyor equipment is moved from one area to another, and because it is used to load materials into storage equipment of varying shapes and sizes, flexibility of the conveyance channel makes the use of multiple screw conveyors of different sizes unnecessary. Some flexible screw conveyors’ conveyance channels can be adjusted in terms of their incline in a range of up to 90° relative to the ground. Flexibility aside, flexible screw conveyors are no different from other screw conveyor varieties. They are still powered by electric or gas-operated motors, and they are an affordable and effective alternative to other conveyor varieties. The flexibility just means that operators of a bulk material system can change the setup or configuration easily as demands change and production quantities go up or down. Flexible Screw Conveyors Flexible screw conveyors are materials handling equipment that involve the use of a rotating screw within a tubular or polygonal conveyance channel. When a motor turns the screw, the material within the channel is forced upwards as the screw turns.